I have had the pleasure and the privilege of watching “The Glory of Christmas” at NorthRidge Church. It was an event that I would never miss and was by far the greatest musical/play that I have ever seen. The performance was based on stories in the Gospel. NorthRidge Pastor Brad Powell said, “Stop celebrating Christmas and start experiencing the gift.” The gift that was presented to many newcomers who had never chosen to follow Christ, and there have been obvious conversions by people who felt that there was something missing. Powell said that sometimes we live our lives trying to live to get attention and love from other people, but the reason that we were created was to know God and to live the life that God created us for. I personally can testify that what he is saying is true. “The Glory of Christmas” attracts thousands of people every year, and this year all 30,000 tickets were sold out weeks before its opening night. 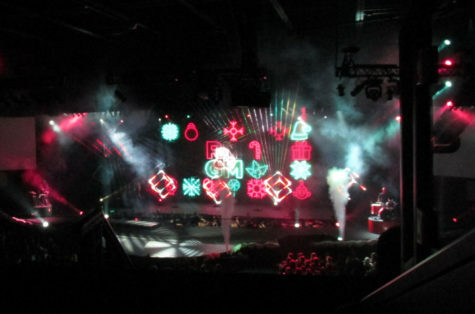 Many church members participated in working with technology, costumes and pyrotechnics backstage. There were members acting, dancing, and helping with guest services, security, janitorial services, food services, props and many other jobs. There were also many kids and students working there, ranging in age from a few months old to in their late twenties. One Canton resident, Kyle Wilkinson, who was a former P-CEP student and now a fitness coach and Detroit’s Top Male Model, was a greeter for the evening. “It’s nice to lend a smile to someone else when they don’t have one on,” Wilkinson said. I got to encounter other individuals like actor and proud homeschooler, Roman Bonacorsi, who played many different roles in the play including a disciple of Jesus. “You know…God is good,” Bonacorsi said. Logan Dennis Willoughby, a member of Northridge, also was involved with the play. Willoughby’s view was shared by many actors and audience members that evening as well. Salem freshman Raphael Ostertag attended the show and was moved by the performance. “I almost cried when the little girl started singing Happy Birthday Jesus,” Ostertag said. I got to see many church goers who had been going to NorthRidge and serving there for longer than I had been alive. This one man, who we call Mr.Jimmy/Jimmy, is a very old man who is always walking around church with a basket of candy, his walker and a very friendly and understanding personality. The show included fully armored Roman soldiers with battle weaponry, angels floating down from the ceiling and the Red Man and Green Man duo. There are DVDs of the performance available for $15.